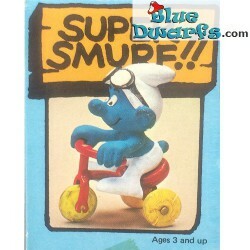 40203: Tricycle Smurf (Supersmurf/ MIB). Page Gaschers Smurf Catalog (2003): 180. Page Davi&Gian smurf Catalog (2013): 274. Condition of the smurf: New (Mint In Box).